Why Invest in Mutual Funds in India? This is a guest post by Ram Mohan. Administrator’s note: I know Ram through an acquaintance I met at a recent event. Since Ram seems to know much about Mutual Funds in India and he has created a course on the topic, I invited him to do a guest post here so that readers can learn more. The below mentioned views and opinions are author’s own. Needless to say, Mutual Funds are subject to market risks. Research, learn and assess them carefully before you invest. A mutual fund is a professionally managed pool of money that is invested in a mixture of stocks, bonds and other asset classes. Buying into a mutual fund gives us a very simple way of investing in a wide variety of stocks and other asset classes with not only minimum investments, but also with minimum risk. In simple words, this is the money invested by many different people into different types of assets to minimize risk and maximize returns. A mutual fund is managed by a person called a fund manager who typically is very senior and has more than 15 years experience in the stock market. The fund manager moves our money, buying and selling stocks as the market moves up and down. This is done actively every single day. The fund manager usually has a team of experts researching stocks and market movements and advising on which shares to buy and which ones to sell. Nowhere else can we expect such active management of our money for such low fees which makes investing in mutual funds all the more attractive. The aim of the fund manager is to increase our money. The major forms of investments in a typical Indian family are Gold, Government Bonds, Bank Deposits, Equities and Property. Now Equities is the share market in general, but covers both stocks and mutual funds. Generally speaking when we track the returns on Equities we use the Sensex or the index of the share market. To make this simpler, we can consider that return on a mutual fund will almost always be greater than the Equities provided we choose our mutual funds wisely. Now take a look at the table below. This shows the return on all these forms of investments pre-tax over a period of 20 years. 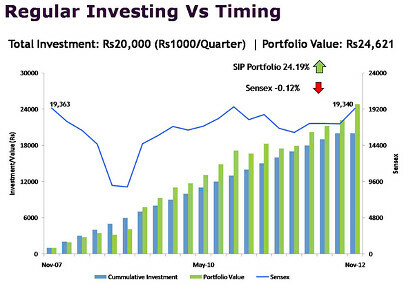 As you can see Equities outshine all the other forms of investments over all periods – 1 year, 5 year, 10, 15 and 20! The only asset class that come anywhere near is Gold, but that is an asset without any fundamental values and driven by Indian desire of the yellow metal. Property is the biggest surprise and this research was done over 7 different cities – Mumbai, Delhi, Bangalore, Kolkata, Hyderabad, Pune and Chennai. I was very surprised to see this report as I expected property to do much better. But the real story is seen even more clearly when you look at the post-tax returns table below. In many cases like Fixed Deposits and Bonds, the return on investment hardly keeps up with inflation. In financial terms, this is called as “invisible” capital erosion. Note that I’ve not considered returns on savings accounts as the name clearly indicates it’s a saving and not any form of investment! Mutual funds are a long term game. You need to consider them only if your investing horizon is minimum 3 to 5 years. Equities have strong underlying fundamentals; true they allow for some speculation in the short term; but such activity ultimately helps discover better long-term pricing/valuation. That, my friend, is the beauty of equities especially in the long run. 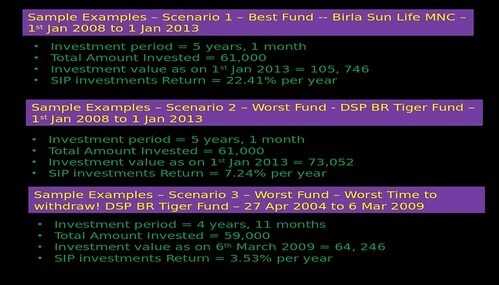 Take a look at the picture below which outlines what the returns would have been on mutual funds over a 10 year period. An average annual return of 13.41% Year-on-Year is nothing to scoff at. And a return of 20.37% is quite unbelievable. To put things in perspective, had you invested Rs. 10,000 and left it for 10 years, at a rate of return of 13.41%, your investment would be more than tripled and become Rs.35,198. But, if you had invested Rs. 10,000 in the best fund which gave a return of 35.78% (during these 10 years), then your investment would multipled 21 times over and become Rs. 2,12,989!!! Please do your calculations and find out any other place where your money could give such returns in other asset classes (not stocks) and leave a note in the comments. To recap in simple terms , your returns over 5 to 10 years could be an average (conversatively) about 12.5% . Note that there are short term funds that you can invest in and get returns of about 10% etc (called liquid funds) but we’ll keep this post simple and not get into the details of those at the moment. This considers the markets from Nov, 2007 to Nov, 2012 (a period of 5 years). During this time the sensex was actually down -0.12%, but if you had invested Rs. 1000/quarter, your investment would have actually ended up earning 24.91% gains! How clever is that? Now that we know what SIP is all about, let’s take a look at one final table which illustrates the power of SIP. The best performing fund gave you 22.41% return, the worst fund gave you 7.24% return. The 3rd example is a very striking one! Not only did you invest in the worst possible fund, you also withdrew on the worst possible day when the markets were at its bottom most (don’t worry, I empathize with you – maybe you had fear or you wanted the money, but you stuck to a 5 years investment horizon). Even at this point you still didn’t lose money at all…you still managed a puny 3.53% a year, but then again investing cannot be done blindly without research. Would you buy a home or car without spending countless hours researching? So once you do the same with investing, expect a clear 12.5% average returns across all your investments. As you can see, investing can be complicated and scary, but I dice it all out to you in about 2 hours of video with all these as well as more examples. I show you how to chose the best funds, the easiest way to invest, and plenty of other tips and tricks. As a special offer, I’m giving this course for $6 instead of the regular price of $27 to the readers of this blog. What is it these days? The price of a coffee and snacks for 2 at Coffee Day? (Sorry, I stopped spending money on such luxuries and invest all of it 🙂 so am not upto speed on the cost of things). You can make thousands if not lakhs easily with the knowledge in this course. So, consider this as a wake-up call for investing if you don’t invest and a chance to learn something more if you do already invest. Note that the coupons are limited and hence will run out if you don’t act fast. Do also let me know in the comments if you would like me to cover any other investing related content in another guest post. So long and happy investing! thanks for this tactic info i’ll surly apply it personaly….